Because of their direct impact on system efficiency, phase noise and phase hits are major concerns in high performance communication systems. These systems rely on stable, low phase noise sources to increase capacity and reduce bit error rate (BER). Additionally, design cycle time, performance, quality and cost targets remain dominant selection criteria for signal sources. In an effort to lead the market trend, Synergy Microwave Corp. has recently introduced a new family of low noise, compact size (0.5" x 0.5" x 0.16") voltage-controlled oscillators (VCOs). Numerous oscillators and VCO designs such as the yttrium-iron-garnet (YIG) oscillator have been developed to reduce phase noise and improve system behavior. While YIG sources exhibit good broadband, low noise capabilities, they tend to be power hungry and physically large. Due to the limitations of these devices, many third and later generation systems incorporate multiple narrowband oscillators/VCOs to cover their bandwidth requirement below 2 GHz. Alternatively, the advanced technology team at Synergy has developed a new line of products utilizing oscillator topologies based on a slow-wave mode-coupling mechanism in conjunction with noise feedback and noise cancellation. This new Distributed Coupled Slow-wave (DCSW) approach provides technology well-suited for discrete as well as integrated circuits, resulting in compact size, better power efficiency, lower cost, superb phase noise, wide bandwidth and faster time-to market development. In spite of their low phase noise levels, YIG oscillators are sensitive to thermal drift, vibration, lighting, electromagnetic interference (EMI), microphonics, phase hits and frequency modulation, all of which are critical in designing modern communication systems. For instance, in point-to-point and point-to-multi-point radio designs, the microsecond switching speed of a VCO is needed to support the requirements for frequency-agility. Unfortunately, the YIG oscillator’s frequency tuning is limited by a relatively slow (millisecond) switching speed range. Mechanically, YIG devices are not conducive to integrated-circuit (IC) integration and related benefits such as high volume production and significant size/cost reduction. YIG oscillators are not readily scalable to nonstandard RF packaging or new frequency ranges; custom YIG sources generally require additional non-recurring-engineering (NRE) costs along with long lead-times. In addition, YIG oscillators require a significant amount of power (typically 300 mA at 12 V or more), which in turn makes thermal dissipation a potential concern, especially when protecting the surrounding circuitry of a microwave radio. The operating temperature range of most YIG oscillators is limited to approximately 0° to +60°C, which is unsuitable for many wireless systems. The new DCYS/DCYR/DCSW series of YIG replacement oscillators overcome these limitations while providing an octave band tuning range, faster tuning speed, low phase noise, low cost, higher power efficiency and small device size. The VCOs using this new-patented technology are currently available for frequencies from 150 to 12000 MHz. The low phase noise performance is exemplified in the DCYR2060-5 device, which measures typical phase noise of –142 dBc/Hz at 100 kHz offset from the carrier for the 200 to 600 MHz frequency band. Fig. 1 Block diagram of a DCYS series wideband VCO. Figure 1 shows a block diagram of the DCYS100200 (frequency band: 1000 to 2000 MHz), which is built on a Rogers substrate (dielectric constant of the material is 3.38) and is capable of providing stable performance over a wide range of operating temperatures from –40° to +85°C. The tiny low noise oscillators are housed in surface-mount packages measuring 0.5" x 0.5" x 0.16". These miniature sources are a fraction of the 1.00 to 1.25 in. cube of the smallest YIG oscillators. The slow-wave mode-coupling mechanism enhances the drive level sensitive Q (quality factor), thereby reducing or even eliminating phase hits, diminishing susceptibility to microphonics (to an extremely low level) and minimizing phase noise while maintaining a broadband linear tuning. Phase noise is reduced by dynamically optimizing the group delay and slope of the impedance transfer function across the guided distributed medium of the slow-wave multi-coupled resonator network. This arrangement can be characterized as an active Q-multiplier circuit with evanescent-mode self-injection coupling and locking mechanism that eventually improves the time average loaded Q of the planar resonator. The novel approach supports multi-octave tuning in a small package, and is compatible with IC fabrication processes. How well does this arrangement perform in terms of phase noise, tuning range and power consumption? As a reference point, the typical phase noise of a commercial YIG-tuned oscillator is –130 dBc/Hz offset 100 kHz from carrier spanning 500 to 2000 MHz, with the combined oscillator circuit and YIG heater current draw that can exceed 500 mA on surges and 100 mA in steady-state operation. A prime design goal met by the DCSW technology is ultra low phase noise performance and a user-definable frequency band that does not compromise other critical parameters such as bandwidth, figure of merits (FOM), temperature stability, size and most importantly high immunity to phase hits. 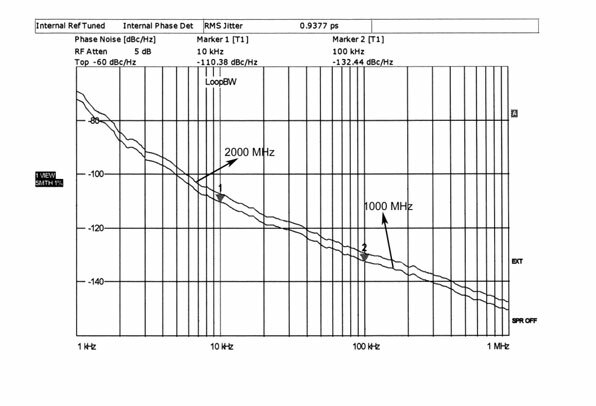 The typical measured phase noise of DCSW120200 (1200 to 2000 MHz) is –132 dBc/Hz at 100 kHz offset from the carrier. At 0.5" x 0.5" x 0.16", the oscillator is smaller than the tiniest commercially available YIG source, and requires less than 40 mA current at +12 VDC. Fig. 2 Measured phase noise of the 1000 to 2000 MHz DCYS1020-12. 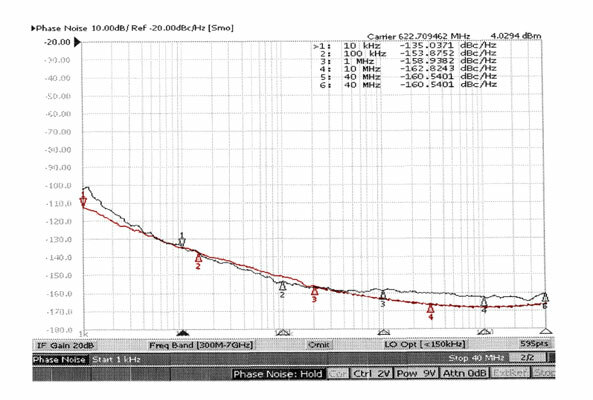 The typical output power is 5 dBm with minimum 10 dB harmonic rejection over the band. Figure 2 shows the phase noise plot of a DCYS100200-12; the typical measured phase noise is –128 dBc/Hz at 100 kHz offset from the carrier with a tuning voltage range of 0 to 28 V. The RF output power is 5 dBm (min) with minimum 10 dB harmonic rejection over the band. The DCYS and DCSW products are based on fundamental oscillation rather than frequency doubling or multiplication, which can result in increased phase hits and jitter. The DCSW series is easily configurable and can be adapted to other frequency bands offering best-in-class performance, cost-effectiveness and power-efficient signal source solutions. 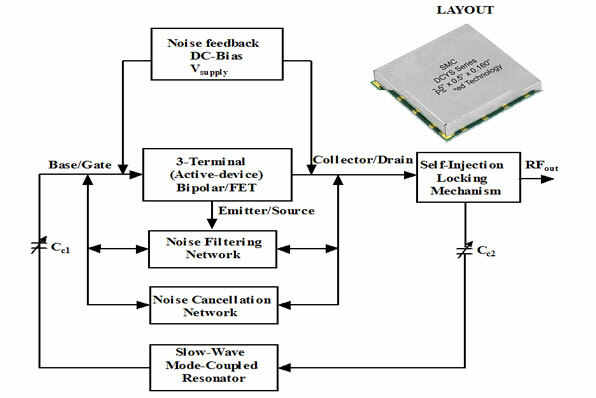 In addition to this, the DCSR series can be used in fixed frequency/narrowband applications providing exceptionally good phase noise performance that rivals the phase noise performance of the commercially available high Q ceramic/SAW resonator-based VCOs for a given class. Fig. 3 Measured phase noise of the DCSR622-12 at 622 MHz. 1–3 The typical measured phase noise for DCSR622-12 (622.08 MHz), as shown in Figure 3, is –155 dBc/Hz at 100 kHz offset from the carrier and requires less than 40 mA current at +12 VDC, with a tuning voltage range of 0 to 8 V. The typical output power is +4 dBm and 30 dB harmonic rejections for optimized narrowband applications. Synergy’s new series of DCYS/ DCYR/DCSW oscillators offer ultra wide bandwidth, and significantly minimize the jitter noise and phase hits. For frequencies as low as 250 MHz and as high as 6000 MHz, the new technology offers a low phase noise alternative to YIGs and other sources, with less susceptibility to vibration and microphonics, less power consumption and smaller size. For applications requiring agile frequency switching speeds, the new oscillators offer the potential of microsecond switching speed for ultra-wideband (UWB) and other emerging wireless applications. The DCSR topology can be extended to other fixed frequencies (200 to 6000 MHz) without expensive NRE or long lead-time of the products. Additional information may be obtained via e-mail at sales@synergymwave.com or from the company’s web site at www.synergymwave.com. U.L. Rohde and A.K. Poddar, “Tunable Frequency, Low Phase Noise and Low Thermal Drift Oscillator,” US Patent No. 7,196,591. U.L. Rohde and A.K. Poddar, “Wideband Voltage Controlled Oscillators Employing Evanescent Mode Coupled Resonators,” US Patent No. 7,180,381. U.L. Rohde, A.K. Poddar and R. Rebel, “Integrated Low Noise Microwave Wideband Push-Push VCO,” US Patent No. 7,088,189.